Open/Close Menu The Maori People have an interesting history which, due to New Zealand's distance from other land masses, began with centuries of isolation from other world cultures. On this page, you will find information about the history of the Maori from the earliest arrivals to New Zealand up through their recent struggles to maintain their cultural identity. This information, written for kids and adults, includes when and how the Maori arrived in New Zealand. The treacherous sea journey across the Tasman Sea from the nearest populated areas over a thousand miles away made New Zealand one of the last places on the planet to be reached by humans. Exactly when the first Polynesian voyagers reached and eventually settled New Zealand is not precisely known; however, it is widely believed to be sometime around 1300 AD. The first Polynesians settled mainly around the coast of New Zealand, and especially the east coast, which has a more hospitable climate. The early settlement period of New Zealand is called the Archaic period. The Museum of New Zealand refers to it as Nga Kakano (the seeds). During this initial period, which took place around 1300 AD, the Maori established many small settlements along the coast and some temporary smaller settlements inland. These settlements average population was three to four hundred people. The early Maori settler's main food were seals and a large flightless bird called the Moa which they hunted to extinction. The early settlers did not call themselves Maori until the arrival of Europeans in New Zealand. At this time, they needed a name to mark their distinction from the new comers. The name Maori which means ordinary came into use. The early Maori were very peaceful in comparison to the later generations of the Classic Period. The classic period, referred to as Te Tipunga (the growth) by the Maori lasted up until 1500 AD. Major events ushered in this period. These events included a cooling of the environment, tsunamis that destroyed many costal settlements, the extinction of several species used for food (especially the moa), and large earthquakes on New Zealand's south island. This period saw a warfare culture emerge with many battles between tribes. These battles were fought hand-to-hand with deadly and efficient weapons. For more information on Maori weapons see Maori Weapons. Each battle was usually preceded by a war dance called the Haka meant to intimidate the enemy. This period also saw the building of hill forts (Pa), mostly on New Zealand's North Island. These forts often used natural barriers such as rivers and swamps on one or more sides. This period also saw beautiful wood carvings and bone and greenstone ornaments of all types. These ornaments had distinctive shapes all of which held a special meaning to the Maori. For more information on Maori carving designs see Maori Carving Designs or to see beautiful hand carved Maori jewelry for sale go to The Bone Art Place. 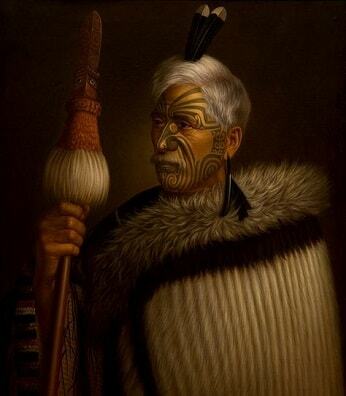 Early European contact with the Maori included Abel Tasman in 1642 and Captain James Cook in 1769. In the late eighteenth century, the Maori increasingly had encounters with sealers and whalers from America and Europe. They also encountered Christian missionaries, deserters from ships, and escaped convicts from Australia. In 1809 the Maori killed sixty-six sailors and passengers which was probably for revenge of the whipping of a Maori chief's son. Survivors told stories of cannibalism carried out on the unfortunate victims. This became known as the Boyd Massacre and it greatly reduced contact with Europeans for many years. In 1830 many Europeans were living among the indigenous people of New Zealand. Diseases such as measles and influenza brought over by the Europeans killed large numbers of Maori. The Europeans also brought over a new weapon, the musket, which was highly sought after by tribes and shifted the balance of power among these tribes. Due to the increasing number of Europeans in New Zealand and the lawlessness thought to exist there Queen Victoria of England, by royal proclamation, annexed New Zealand in January 1840. The British sent William Hobson with instructions to take possession of New Zealand. In February 1840, Hobson negotiated the Treaty of Waitangi which some Maori chiefs signed, and others soon signed. However, some powerful chiefs refused to sign. In return for accepting some form of British government the Treaty of Waitangi gave the Maori rights of British subjects and guaranteed tribal autonomy and property rights. In the 1860's due to friction between the Maori and English the New Zealand wars occurred. This resulted in the British taking large amounts of Maori land as punishment for what they considered a rebellion. In 1862 and 1865 the Native Land Acts resulted in the Maori losing almost all their land. After this the Maori population dropped drastically and by the late 19th century it seemed like the Maori people and culture would disappear assimilating into the European population. Today the Maori people and culture are alive and well. This is largely due to several Maori politicians who saw the need to assimilate with the Europeans while maintaining the unique Maori culture. This has resulted in a steady increase in the Maori population and use of the traditional Maori language.